Dirty Little Secrets is an excellent example of how to write a psychological thriller. I remember being totally gripped by Jo Spain’s previous novel The Confession last year, so I jumped at the chance to read her second and I dived into it straight away; Jo Spain has delivered another brilliant book. Told from the perspectives of residents within a tight-knit community it makes for an utterly compulsive read that I could not put down. The gated community known as Withered Vale is a collection of exclusive properties for the very wealthy. At the beginning of the book, one of the residents, Olive Collins, is found dead, but here’s the thing, her body was left rotting away in her house for three months before it was discovered. How could anyone not have checked on her in all that time, or realised that something was wrong? Already I could feel the tension as I wondered which of the neighbours knew something about Olive’s death and if any of them had played a part in it. This book really will make you examine your own neighbours just that little more closely. Within such a small, tight-knit space there are some very different characters, who all have their own sets of problems. And it becomes very clear that none of them were particularly keen on Olive. So was one of them responsible for her death? Jo Spain gets to know the psychology of her character’s really well, as I was reading I had suspicions of just about all of them. We also get to hear from Olive’s perspective, I found this unusual at first, because at this point, she is already dead, but as I got into the story, I thought it worked really well. 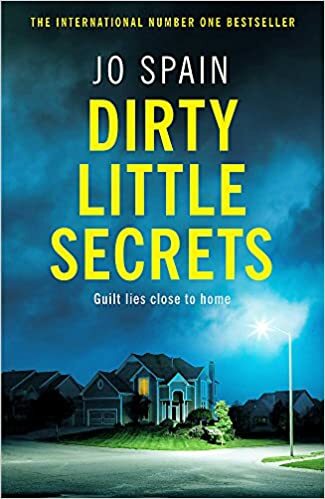 We often don’t get to hear from the perspectives of victim’s in crime novels, so this is what made Dirty Little Secrets a really interesting read. I’m sure Olive is a character who will provoke strong opinions among readers. This is an excellent, character-driven novel that I am a big, big fan of. Jo Spain has leapt onto my list of must-read authors. She creates a real sense that everyone in this book is hiding something and I just had to know what the truth was. Thank you to Quercus Books and Netgalley for providing me with an advance review copy. If you would like to purchase Dirty Little Secrets, you can do so by clicking on one of the following links below. I had a feeling you’d enjoy this one. Glad to see I was right and Jo made your list of must-read authors as well! Thank you Beth, it was great to meet you as well.